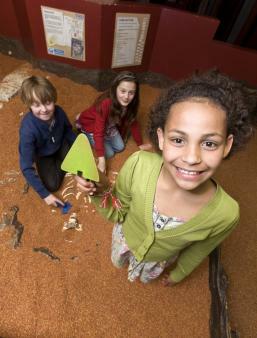 Dig, delve and discover objects and stories from the past at York's wonderfully interactive DIG, a real archeological adventure for children (and adults). We give it our parent-tested seal of approval! Grab a trowel and get digging − there are bones, beads and lots of archeological fragments to be found at DIG in York. Elena Dalrymple visited with Kate, 10, Tom, 7, and Emily, 3. 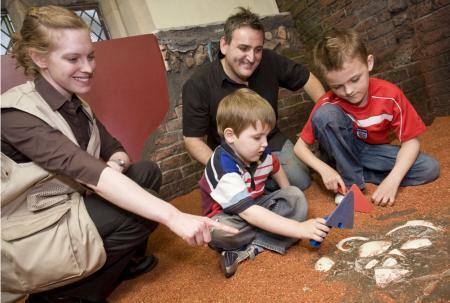 Run by the York Archaeological Trust, DIG offers children from 2 to teenage the chance to get hands-on with the past. The highlight of any visit is a chance to uncover treasures in the four dig pits, based on real excavations undertaken in York in recent years (the Roman fortress at Blake Street, the Viking settlement of Jorvik at Coppergate, the medieval priory at Fishergate and the Victorian slums at Hungate). 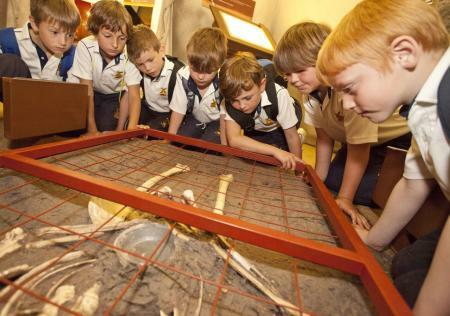 Skeletons and other replica artefacts are waiting to be found and an archaeologist is in hand to help you examine your findings. The Little Diggers timed tour, specially aimed at children under 5. The children on our session were hugely enthusiastic about their digging duties and loved calling over their guide (an archeology graduate) to examine their finds (all the archaeological explanations were brilliantly age-appropriate). The "soil" the children dig through is brown plastic crumb, so while you might be shaking it out of your shoes for a few hours after you leave you won't need to bring a change of clothes. After the tour wind down in the museum's Little Diggers Zone where you can play Roman and Viking games (anyone for hnefataf? ), try a craft activity (we designed our own snakes and ladders game), dress up in Viking garb, stage a show in the puppet theatre, renact battles with the toy castle and Viking ship and drink a glass of squash to keep you going. The York Revealed activity zone, a holographic film and loads of hands-on activity booths. Prepare a feast for a Viking with some wooden food and bowls, design a mosaic, make a stained-glass window design with coloured plastic shapes and a lightbox and take a look at insect life in Victorian York through a miscroscope... There's loads to do! Don't forget to make a brass rubbing to take home as a memento. Before your visit download a free DIG Find it Trail from the website for an on-site artefact treasure hunt. The detailed (and fascinating) story of the Hungate archaeological dig. Get up close and personal with Skeleton 58, who died in Roman Hungate, and understand more about how archeologists studied his remains and discovered new facts about Roman burials and cemetaries. Jewellery placed in graves over 1500 years ago is also on display. Older children also loved the chance to touch and examine real artefacts; the archeologist guide on hand to help them identify their 'finds' was very inspirational and informative. Picking up a trowel and helping with the digging − great fun whatever your age! Though you can just look around the museum on your own, access to the dig pits is by guided tour only. Each tour is led by an archaeologist who is on hand to answer questions and help you examine real archaeological finds (Viking-age poo is of particular interest to children!) and catalogue different specimens, so interactivity is guaranteed. There is no on-site cafe or indoor picnic area in the museum, but you can picnic outside in the DIG sensory garden, munching a sandwich while you touch archaeological fragments, smell historic plants and soak up the atmosphere in the grounds of St Saviour's Church. DIG is in St Saviour's Church, York. Open daily, 10am-5pm (last admission 4pm). Closed 24-26 December; opening times vary over the festive period. Admission: Adult £6, Child aged 5-16 £5.50. Family tickets are available. (If you're planning to vist more than one York attraction it's worth investigating the savings offered by a York Pass or considering a joint ticket for Yorvik and DIG). Tickets are valid for 12 months and you can return as often as you like. Visits are timed and guided by real archaeologists. You can just turn up and join a tour but at weekends and during school holidays it's best to pre-book. Plenty in the museum shop, from replica helmets and Roman coins to activity books and a guide to York from Terry Deary (author of Horrible Histories). 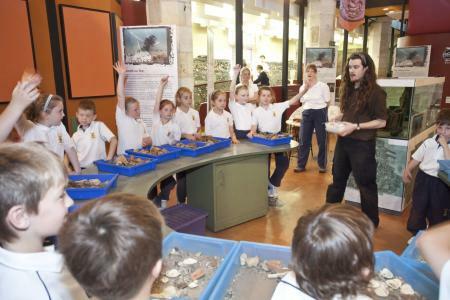 Find out more about archaeology and consult an archaeological timeline on the museum website.